This entry was posted in Senior Citizens and tagged care for the old, crime against senior citizens, help for senior citizens, helpage, protection for senior citizens, Senior Citizens on August 14, 2014 by densonjoseph. Crime prevention is everybody’s business! It’s not just a job for law enforcement. going to the bank with a friend – can help prevent crime. by being careful, alert and a good neighbour. Use busy, well lighted stops. Watch who gets on or off the bus or trolley with you. If you feel uneasy, walk directly to a place where there are other people. When using the bus or other public transportation, sit near the drive if possible. .Be wary of exaggerated claims for health and medical products, such as cures for cancer or arthritis, hair restorers, quick weight loss. Before buying any cure-alls, check with your doctor, pharmacist, or clinic.
. Don’t give any details about your credit cards to phone solicitors even if they offer you gifts, a free vacation, or a sweepstakes prize.
. Check out any “work-at-home” schemes with your local or state consumer protection agency.
. Don’t give credit cards, cheque books, or savings account passbooks to your housekeeper or caretaker. Don’t make an employee a joint owner of your bank account or your property.6. Never make cash transactions in secret. Discuss any large transaction with your banker. Call up your local NGO to help you deal with the trauma that all crime victims experience. They can help you learn more about counselling, victim compensation laws and how to follow your case’s progress. 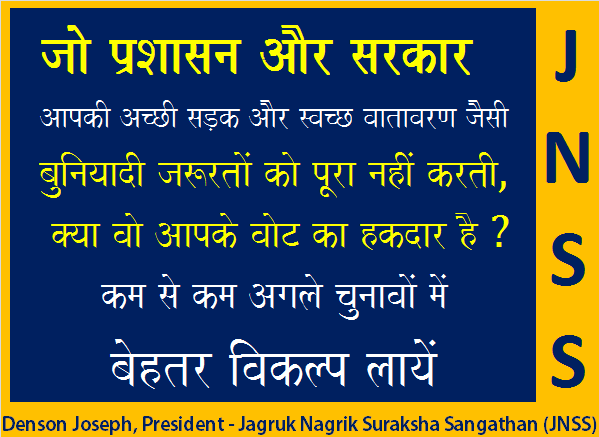 Be more socially active and if possible start a crime prevention program in your neighbourhood in association with organizations like JAGRUK NAGRIK SURAKSHA SANGATHAN (JNSS). This entry was posted in Uncategorized on August 14, 2014 by densonjoseph. Child begging: The bane of modern India. This entry was posted in Transformation through Education and tagged children, crime, hcl, India, infosys, JNSS, jnssindia, poor, poverty, sahara, underprivileged, unicef, wipro on September 27, 2012 by densonjoseph. A NEEDLE CAN SAVE THE LIFE OF A STROKE PATIENT – From Chinese professor. can help somebody one day. injection syringe that would be the best. Otherwise, a sewing needle or a straight pin will do. prick the tip of all 10 fingers. 6. If the victim’s mouth is crooked, then pull on his ears until they are red. barely managing to walk, then it is by the grace of his ancestors. effective. In 1979, I was teaching in Fung Gaap College in Tai Chung. I immediately went to the 3rd floor. When I saw our supervisor, Mr.
the shape of his mouth returned to normal and his speech became clear. one night and was released the next day to return to school to teach. a short time, the victim will be revived and regain 100% normality. may help save a life from stroke. May you be happy and well. Pl. circulate this INFO as much as possible among your groups as we often lose our dear ones to STROKE because of lack of knowledge or lack of information…. Save Somebody’s life…..God Bless you…. Thank you R.Vimala Vidya, Journalist & Photographer, vimalavidya@gmail.com for this wonder lifesaving piece of info you have sent to us. This entry was posted in Saving a Life, Senior Citizens and tagged aged, death, Denson, elderly, help, India, indifferent, JNSS, Joseph, life, metro, old, save, seniorcitizens, Stroke, support, Vidya, Vimala, webhelp on April 22, 2012 by densonjoseph.